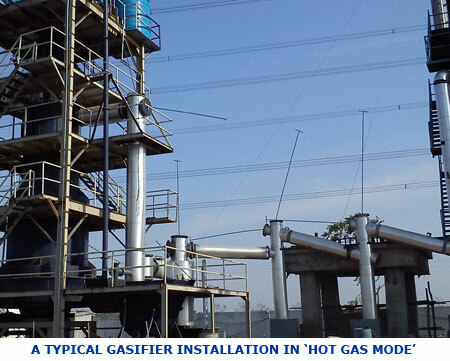 HOT GAS MODE’ is the simplest and most efficient configuration for utilization of gasifiers for thermal (heating) applications. In this mode, the gas is exited from gasifier at such temperature that volatile constituents in gas (tars) remain in vapour form till the gas reaches the burner(s). To minimize condensation during transit, gas is conveyed through an insulated pipeline. Coarse dust particles are removed in preliminary dust catching equipment such as settlers and cyclones. Fine dust is difficult to remove and gets carried along with the gas. Water consumption is minimal in this mode. Despite removal of coarse particles and insulation of pipeline, small amounts of dust & tar continuously keep settling in the gas pipeline and passages. This requires to be cleaned periodically. Generally, online cleaning provisions are made to achieve uninterrupted long duration operation. Non-stop round-the-clock operations extending to 3-4 months are common in well designed ‘Hot Gas Mode’ gasifier configurations. The energy content in hot gas (including sensible heat and energy of tar vapour) is of the order of 1450-1550 kcal/Nm3. The hot gas efficiencies are of the order of 80-85%. Higher flame / furnace temperatures are achieved with ‘hot gas’ as compared to that with ‘cold gas’.